It turns out, Infinity War was almost a very different movie than what we ultimately got. Directors Joe Russo and Anthony Russo, who are currently hard at work finishing up next year's sequel, the currently untitled Avengers 4, had the seemingly impossible task of bringing virtually every character from the Marvel Cinematic Universe together to do battle with Thanos, a villain that had been built up since that famed post-credit scene in 2012. By most accounts, they did an admirable job, but that involved a lot of working the story over in the development process. More than we may have realized as an early draft features narration from Thanos. The Russo brothers participated in a lengthy Q&A recently following a screening of Infinity War. Even though we didn't get the title or trailer for Avengers 4 during the event, which many were hoping for, the filmmakers did drop quite a few interesting tidbits about the movie. Speaking about an earlier draft, it was revealed that Thanos was going to provide narration in a much longer, non-linear version of the story. Here's what Joe Russo had to say about it. "We did three drafts of this that were all radically different. 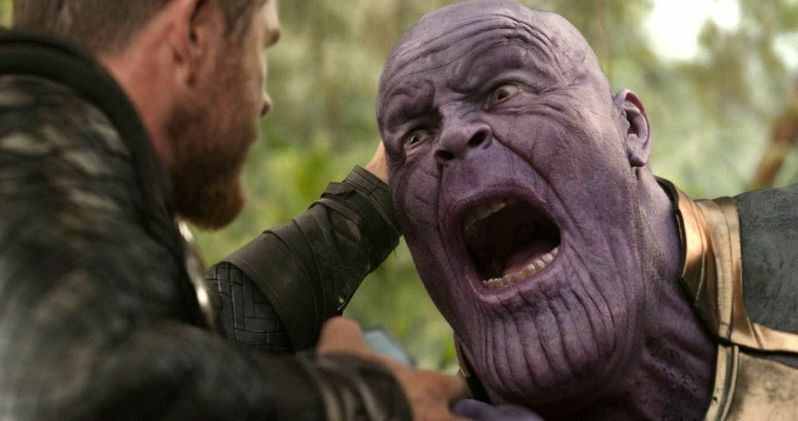 One draft involved Thanos as the narrator of the film. It was non-linear in structure, it had backstories for the Black Order, and they were all introduced in very cool sequences. But it ended up being a 250-page script and we thought, 'Alright, we can't fit all of this storytelling.' A lot of times when you work on a movie of this scale and you end up with a 250-page draft, it's the bible for the movie. You gain a lot of information. You write characters out in a way that you start to understand what it is they want. I think writing out Thanos' narration gave us insight into who he was as a character and what we wanted him to do in this film. So then it was much easier once we started pulling all that out to make it subtext for him as a character, and to make a more linear structure." Christopher Markus and Stephen McFeely actually wrote the screenplay but obviously, the Russos were very heavily involved. The idea of Thanos, who more or less serves as the protagonist of Infinity War, providing narration is certainly interesting. But this movie had a lot to tackle and the decision to make it as streamlined as possible seemed to help out a lot. And, as they explain, it's not as though that massive 250-page version went to waste. It helped inform a lot of the character motivations that inspired what made it to the screen. Ultimately, it was when they decided that it was a heist movie at its core that things changed. "We did a lot of development on this, but at a certain point we thought, 'This is really a heist movie, and Thanos is enacting a heist. It's gotta have a certain structure to it that reflects a heist film.' So if you look at the movie, it's actually is sort of like Two Days in the Valley or Out of Sight where there's multiple McGuffins that Thanos is chasing and that all the other characters are trying to get to first, or stop him from getting. So it's a very simple structure. We thought, we have so many characters in the movie, we have to simplify the structure. I think that's really what led us from that 250-page draft to what the movie is now is simplifying the plot, keeping it linear, and letting the character moments come through." Whatever the process was, it worked out for the best. Infinity War was championed by both critics and fans alike on its way to more than $2 billion at the global box office, making it one of the most successful movies ever made. The only problem is that it's placed an unbelievable amount of pressure on Avengers 4, which hits theaters on May 3, 2019, to deliver the goods. This news was first reported by Collider.